US ambassador to the United Nations Nikki Haley has asked India to deal cautiously with Iran in the backdrop of New Delhi exhibiting reluctance to toe the US line of sanctions against Tehran. India is already mulling alternative modes of payment for future oil imports from Iran. New Delhi (Sputnik) — Haley said on Thursday that a nuclear Iran will be a major threat to global peace and that it has the potential to become "the next North Korea." Haley, who was on a two-day official visit to New Delhi, has asked India and other countries to keep pressuring Iran like in the case of North Korea. "The world is united against Iran having nuclear weapons, because we all have good reason to worry about what Iran would do with these weapons … We believe that Iran is a threat and we have proof. Iran has, despite the Joint Comprehensive Plan of Action (JCPOA) agreement, violated multiple resolutions. 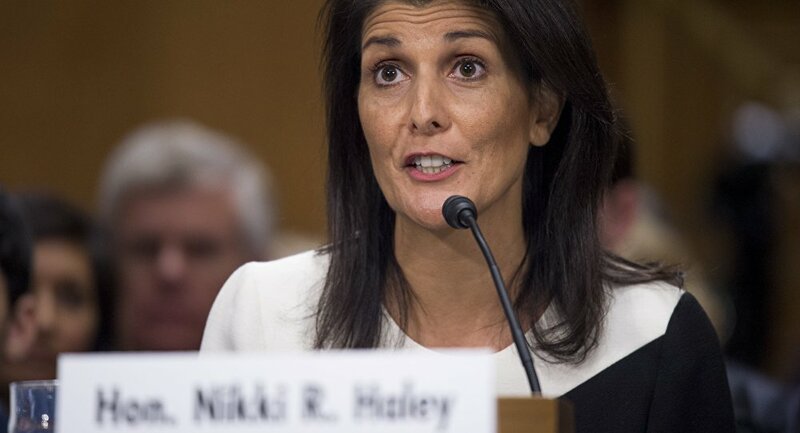 We are holding Iran to account as Iran can become the next North Korea," Haley said while speaking at an event organized by the private think tank ORF in New Delhi. The Trump administration withdrew from the JCPOA in May and ordered the re-imposition of sanctions. Earlier this week, the US asked all countries dealing with Tehran to stop their oil imports from the date of sanction imposition, i.e. from November 2018. However, India has indicated its reluctance to follow the US sanctions on Iran. New Delhi has already started negotiations with Tehran on the modes of payment other than the dollar for future imports. Meanwhile, Haley also said that the UN has not acknowledged Trump's meeting with the leaders of North Korea, because nothing has happened yet. The "international community should be commended for where we are with North Korea. We all completely isolated them for their behavior and brought them to the negotiating table. Will Political will displayed at summit lead them to denuclearize? We need to full action on denuclearization, otherwise the sanctions will remain where they are," Haley added.